Will Allen has been in wildlife photography and cinematographer since 2003. Primarily focused on aquatic life he has worked on several adventure documentary films including Bouvetoya, The Last Place on Earth, traveling to the most remote uninhabited island on earth with a small group of explorers to summit the island. He has worked on five IMAX films including Ultimate Wave Tahiti 3D and Rescue 3D with director Stephen Low. However, the films that have meant the most have been Revolution and the upcoming Sharkwater: Extinction with his late friend Rob Stewart. They both shared the same passion for the planet, the ocean and saving its inhabitants through conservation and education. Aside from working as a cinematographer, Will co-owns two restaurants in Montreal, Quebec where they try to exercise the buy local mentality and serve only sustainable foods in a plastic free environment. 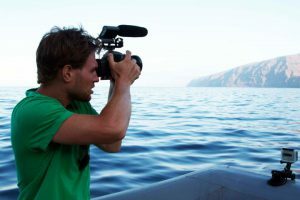 He hopes, through his efforts in film and photography, to share the beauty of the oceans to inspire future generations to make positive change towards helping the environment.